Many thought we were weak, looking for "father-figures" or losing our identities. The following is my answer to some of these comments. Jack and I are new to Domestic Discipline - but I don't think we'll ever go back to any other type of marriage. This is an "old-fashioned" type of marriage where the man is the head of the household, takes care of his loved ones, enforces the rules of the house and makes the final decisions. And what does a DD wife do? She gives the man she loves respect, obedience, love and admiration! Are we door mats? Not at all! My hubby listens to all my opinions and takes them all into consideration, then makes the final decision. Why do I agree to this? Because (as Jack says) there can only be one captain on a ship - otherwise there's chaos. We made a list together of the things that we want in our marriage. When my HoH has broken one of our rules - he has to apologize. That is a big thing for him! When I break a rule, I get disciplined! How could I ever love and respect a man I could spank? Someone has to enforce the rules! I make the waves - he gets the boat on course - and I adore him for this. He is so much more involved in our marriage now - working to make our days happy, loving, calm and peaceful. I love domestic discipline - no more days of cold shoulders, and the silent treatment! Problems are solved on the spot and when I have learned my lesson, we cuddle and make love and are happy again. I make decisions on behalf of other people all day long at work - but at home I've handed over the reins to my Jack and that works perfectly. I would like to add, that my hubby doesn't have the right to spank me for daily things such as cleaning the house etc....I'm not his slave. We share the responsibilities of the daily chores together - but he does have total control over everything that upsets our marriage. 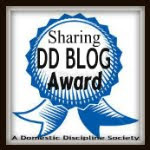 Domestic Discipline is not only about punishment! Spankings are a means to achieve a better conduct in a marriage. I can imagine that most couples, in time, have no use for discipline when they've learned to communicate in a loving and respectful manner. We found that it does not change the core of who we are, but lets the person you were deep inside not be afraid to come out- for both of us. As far as the slave aspect, my hubby does way more around the house than he ever did before ttwd. It is not for everyone, but I'm happy it is for us! Lovely post! We've finally hit the point of no return, the point where we know there's no going back to the way things were before we started this lifestyle... and finally reaching this point has made me so stinkin' happy! At work, I'm all balls and brass. I'm more than happy to hand the reins over to my hubby when I get home. Some days it's harder to relax than others, but he's always happy to help me with that, too.